FTI industrial process pumps are engineered and precision manufactured meeting ISO9001 standards. Centrifugal pumps include: magnetic drive pumps, vertical pumps, multi-stage pumps, ETFE-lined ANSI dimensional pumps for extreme chemical applications, and plastic or stainless steel mechanical sealed pumps for duty in corrosive environments. Drum/barrel pumps in varying sizes and constructions are offered to safely and efficiently transfer acids, chemicals, solvents and high viscosity fluids. FTI centrifugal pumps are constructed from rugged, corrosion resistant materials including heavy gauge stainless steel and plastics specifically engineered for maximum corrosion resistance. Pumps are available in either vertical or horizontal configurations, either mechanically sealed or magnetically coupled for sealless operation. Mag drive pumps feature high-powered, rare earth magnetic couplings which allow the transmission of maximum horsepower. MSKC Series Multi-stage, sealless, plastic, horizontal. Manufactured from corrosion resistant polypropylene or PVDF, MSKC Series horizontal centrifugal pumps are designed to provide years of reliable service. MSKC Series pumps feature state of the art magnetic coupling technology that results in a leak-proof design. Multiple impellers allow for a small footprint with smaller motors. These pumps offer excellent corrosion resistance and are available in a various impeller combinations. MSKC Series pumps feature outstanding run dry ability when equipped with a carbon bushing. KC Series Sealless, plastic, horizontal. FTI Magnetic Drive pumps are manufactured from corrosion resistant polypropylene or PVDF and provide years of reliable service. Utilizing advanced, magnetic coupling technology, these sealless pumps are an ideal replacement for mechanical sealed pumps in corrosive applications. Most KC Series mag drive pumps feature out-standing run dry ability when equipped with a carbon bushing. 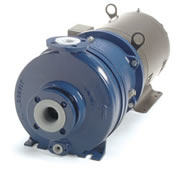 The Magnet Drive KC Series pumps offer a wide range of sizes and motor frames and ATEX certified models are available. UC Series (ULTRAChem®) ETFE lined, sealless ANSI Dimensional. Rugged, durable UC Series pumps provide excellent corrosion resistance. Features include heavy duty ductile iron casings lined with pure Tefzel® (ETFE), modified concentric volutes to reduce radial loads, rear sealing ring and balance holes to reduce axial loads and premium silicon carbide components. Magnetic drive UC Series pumps are engineered for long life in the most demanding applications. Atex certified models are available. Magnetic Drive - VKC Series Vertical, sealless, plastic. Vertical, magnetic drive centrifugal pumps (VKC) in polypropylene or PVDF materials are designed to provide years of reliable service. VKC Series pumps feature state of the art magnetic coupling technology, which allows for a completely sealed column that prevents aeration, micro-bubbles and the release of fugitive emissions. 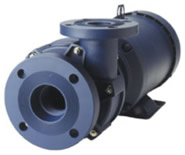 These pumps offer excellent corrosion resistance and are available in a wide range of sizes. Finish Thompson powered, portable drum pumps are designed to provide safe and easy transfer of a wide range of fluids including difficult to handle liquids such as acids, bases and solvents. Containers are quickly filled or emptied without spills or splashes. Many different models and pump tube lengths are available to satisfy diverse customer requirements.